What is the most resilient parasite? A single idea from the human mind can build cities. An idea can transform the world and rewrite all the rules. On March 19, 1999, Steve Forbes entered the crowded field as a candidate for the Republican nomination for President of the United States. There were nine candidates running and Forbes’ entry would made it a field of ten. The son of publishing magnate Malcolm Forbes, Steve was little known in national politics and most observers bet his only chance of winning on massive spending from his personal fortune. But the unique advantage of personally bankrolling a campaign vanished when rival candidate Morry Taylor, a millionaire wheel magnate from Quincy, IL, spent about $1.5 million of his personal fortune on TV ads in the early days of the campaign. Despite the odds, Forbes shot past eight of his rivals in the first few primaries to become the solid second place contender behind Bob Dole, the long-standing US Senator from Kansas. Most credit the success of Forbes’ campaign to his ability to present new, compelling ideas that challenged his audiences. One idea, the flat tax, eventually took center stage and became almost synonymous with the Forbes campaign. USA Today reported, “Dole pokes fun at Forbes for being a one-note candidate: "You ask him about your headache, he gives you his flat tax message." The story of how Steve Forbes, a virtual political unknown nationally, could enter a crowded field and have a solid shot at winning the Republican presidential nomination is the story of just how powerful an idea, skillfully delivered, can be. The essence of using an idea to persuade is to sell an audience on a unique idea which, if accepted, gains acceptance for your candidate, product, or proposal. In short, buy my idea, buy what I am selling. 1. Idea ownership. Steve Forbes “owned” the idea of the flat tax. If you wanted it as part of your future, he was the guy who could deliver and you had to vote for him. 2. Sell an idea as feature. In 2003 Seachange Technology introduced a new idea to structure video storage by using a ring pattern instead of the commonly used linear structure. If IT audiences bought the idea of the ring structure, they had to buy from Seachange, the only supplier who had it. 4. Change that requires specific expertise. A technology company proposed using new digital technology to change the workflow at a radio stations. While many suppliers offered the equipment necessary, implementing the changes in workflow required specific expertise that only this company could provide. What idea can we advocate which, if accepted, generates preference for our product or service? Have ideas been used to manipulate? Many times. In the 1960's Shell Oil sold the idea that an ingredient in their gasoline, platformate, gained cars extra mileage. Was it true? Yes. In the dramatic 60 second TV spot that follows Shell sells this idea. Shell correctly assumed that most Americans have little understanding of petroleum products. In the ad Shell did not mention that all brands of gasoline had platformate. But if you bought the idea that an ingredient in Shell gasoline extended gas mileage would you buy your gas from Shell? Many did. That's a pretty resilient parasite. Kevin Kelly, editor of Wired magazine in its early and truly great years wrote a book with a chapter I highly recommend to everyone in media. It's called, "Relationship Tech, Start With Technology End With Trust." Kelly, being a "content should be free" Internet kind of guy has posted the entire contents of this book for free on the web. I recommend reading it. So many of the issues we face in media are touched by his vision. "Expertise now resides in fanatical customers. The world’s best experts on your product or service don’t work for your company. They are your customers, or a hobby tribe." 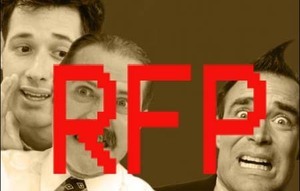 "Companies need user groups almost as much as users need them. User groups are better than advertising when customers are happy and worse than cancer when they are not. Used properly, aficionados can make or break products." Good products and services are cocreated: The desires of customers grow out of what is possible, and what is possible is made real by companies following new customer desires. Because creation in a network is a cocreation, a prosumptive act, a multifaceted relationship must exist between the cocreators. "...whoever has the smartest customers wins." As more marketers see their website as the hub of their marketing efforts, reviewing that site before calling on them becomes essential. But you are not an expert on their business. What can you actually speak credibly about that a client will listen to? Simple. Talk about your readers, their site visitors. Look carefully at their home page and think about your magazine/brand's readers and how they would respond. Never criticize your client’s website. The marketing manager you are calling on could be it's architect. But if you can engage your client in a dialog about trends effecting your readers and advocate prioritizing future content you can help advance their online marketing goals. The sad truth is that many websites are not constructed with a company’s customers, your readers, in mind. Many websites first fulfill internal political goals, or are designed against the claims of competitors. Primary reader benefits can take a back seat. If you discover this sharing your readers point of view, in noncritical way by talking about future content, can make you a marketing hero. 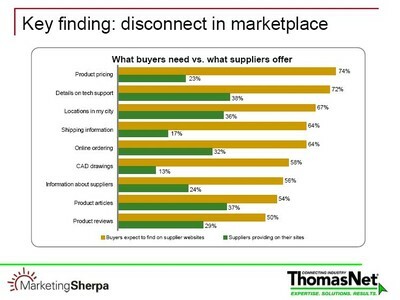 At the recent "Selling Online Subscriptions" conference put on by MarketingSherpa, Linda Ragano, from ThomasNet shared this a piece of research that documented a disconnect between what manufacturers posted on their websites, versus what the targeted buyers actually wanted to see. If you sense this kind of disconnect on your client's site use Linda's slide as a third party example to make the point in a noncritical way. Say, "In some industries (read: not yours) there is disconnect between what readers/visitors want to see on a web site and what gets posted. Show the chart. Then share insights you have about your readers/their site visitors might like to see in the future. Focusing on the future is a good way to share your knowledge without being critical of the present. Your client can then go to management and say, "Look what we can do to improve things in the future." Both you and your client become marketing heros. Are you good looking enough to be a rep? 1. A n average looking rep that knows their products and can sell. 2. Doesn't matter. Too many other factors come into play regarding sales. 3. A super attractive rep that is an idiot and can't sell. A bit over 17%, about one in six, picked #3. Some may find this funny, some not. But it raises a serious question of how we as individual salespeople differentiate ourselves in the field. If what we sell and how we sell it becomes a commodity...what's left? Do you have to be attractive to be a media sales rep? I don't think so. But many may disagree. In response to my last post that showed how Hilary Clinton's "Red Phone" ad is based on a common media sales technique, I got a question, "What should I do when I am on the receiving end of the "fear card" or similar attack?" When a competitor attacks...say. "Thank you!" Often they have handed you a gun to shoot them with. Whether the attack is the "fear card" or another approach the steps to respond are they same. The bigger and grander the attack, the bigger the advantage has been handed to you. First, get a document of the attack; a promotional brochure, email, web post etc. You will need it so you can go line by line as you counter it. Second, Initially, you need to react emotionally. Why emotionally? Because if the "fear card" is emotional, and you cannot rationalized emotion away. If you respond without feeling, on some emotional level you are saying the fear or criticism is OK.
Also, at the heart of every successful media sale is the passion for what you sell. No passion, no sale. If you are passionate about your media and someone takes a shot at it, if you stay completely calm how genuine does that passion look? Don't display any anger that feels unnatural. Your reaction needs to be genuine you, no forced hysterics. I use a simple, "They said WHAT? Do you know how CRAZY that is? I can't believe they would tell you that!" From the campaign trail, Bill Clinton has recently been ridiculed in the press for his "angry red faced finger wagging" responses to perceived attacks. He may look odd on on the news clips but his technique is sound. I fear that Barack Obama's cool response to some of Clinton's early attacks may not serve him well long term. Third: ask about the damage. Ask if the "fear card" or criticism changed their attitude or raised concerns about your product. The "fear card" only sticks where they are doubts. Ask your client to share those doubts. Now, counter them. Fourth: Now, respond to the doubts rationally. Take the print out of the attack and go line by line and show your side of the argument. You need to win over your client or, at the very least, prove that your side has at equal merit. Fifth: Now, go offensive. Label your competitors approach as "sales technique" designed to manipulate feelings. No buyer likes to feel manipulated or played for a fool. Raise questions as to why a competitor might do this; desperation? Disrespect for the intelligence of the media buyer? Sixth: Now, depending how well you have turned this around, see if you can't build some emotional resentment in your client from the attack. If you really have won over your client, ask, "Now that you can see the other point of view you can see how manipulative this was. (With a smile) How dumb to they think you must be to fall for this?" No buyer likes to think of them selves as having been "had" by a manipulative sales attack. If you can win them back they will often harbor resentment for the competitor who initiated the attack and be suspicious of them for a long time.